State Sen. Steve Gallardo said he felt the need to come out publicly partly because of the recent battle against a bill approved by the Arizona Legislature that would have allowed businesses to refuse service to gays based on religious beliefs. “In the middle of that discussion, it dawned on me that this bill affects me directly, and seeing all the people come to the Capitol protesting and rallying around this bill solidified my thought and that it’s time for me to stand up and say, ‘This is who I am,'” he said. Gov. Jan Brewer vetoed the bill after strong opposition from the business community. Gallardo, 45, said he also wants to send a message to members of the LGBT community who struggle with coming out as gay. He added that his family and friends have known about his sexuality for a long time. The Phoenix Democrat is running for the open U.S. House seat being vacated by the retirement of Rep. Ed Pastor. Gallardo served in the state House of Representatives from 2003 to 2009 and has been a state senator since 2011. 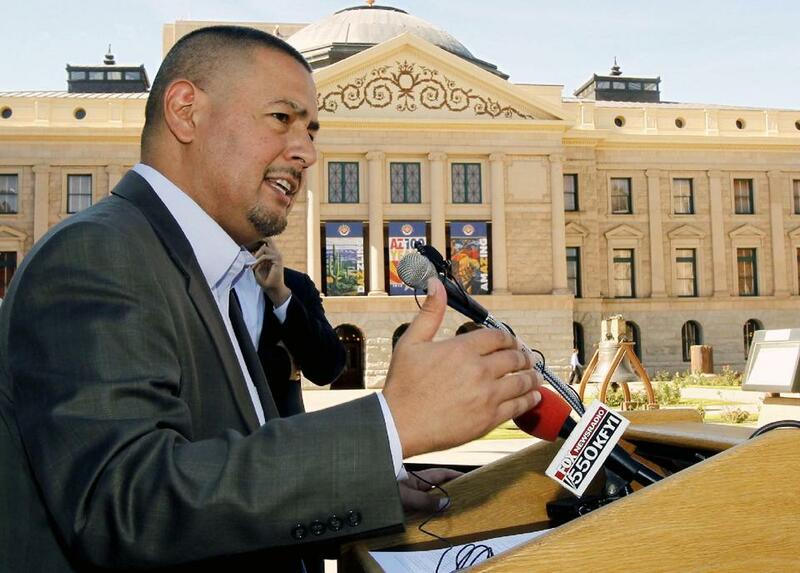 He is one of three openly gay legislators in Arizona: Sen. Robert Meza, D-Phoenix, and Rep. Demion Clinco, D-Tucson. U.S. Rep. Kyrsten Sinema, a Democrat, has said she is bisexual. Pastor’s announcement last month that he would not run for re-election is expected to set the stage for a contested Democratic primary in the 7th Congressional District. The heavily Hispanic District is located entirely in Phoenix and is solidly Democratic. As I’ve said, substitute the word “People of Color” into any of the arguments (or proposed new laws) against Gays and Lesbians the far right wing-nut, Bible thumpers are putting forth and the blatant bigotry of their effort becomes painfully clear. Sadly, the latest public debate against legalizing Gay marriage and equal rights under law has been commanded by a well-organized (albeit unlikely) combination of Roman Catholic and fundamentalist, evangelical “Christian” institutions. The latter remain particularly non-inclusive in their approach to religion. Fortunately, the hypocrisy of such “Christian” behavior (purported to be founded on principles of love, inclusiveness and acceptance, but which has now resulted in narrow intolerance for the beliefs and private sexual behavior of others) is blatantly on display for the rest of the world to see. Thankfully, it’s becoming ever harder for most Christians (even many who still call themselves Roman Catholic) to blindly accept lectures on what is “abnormal” sexual behavior from an institution that still firmly considers celibacy for its priests to be “normal”. And, any government that truly believes in the full separation of Church and State should also recognize and then dismiss such protestations over Gay rights from these well-moneyed, far-right, fundamentalist institutions for what they really are…a desperate, last-ditch attempt to salvage what’s left of the Church’s once complete (but now ever-shrinking) power to control people’s money, thoughts and lives.